As therapists at The Allergy and Health Test Clinic, Katherine and I always follow our own advice. As nutrition is not a one-diet-fits-all business, we both follow different diets for different reasons. I follow a paleolithic style diet. This diet focuses on good quality vegetables, meats, fish, and healthy fats such as flaxseed and olive oil, together with some fruits, nuts and seeds. Carbohyrdates are not restricted, but instead are sourced from starchy vegetables rather than wheat, corn, rice etc. There are no processed foods or sugars, and no dairy (although I do have live yoghurt once a day). The benefits of this diet are weight regulation without counting calories or weighing foods, increased satiety from meals (meaning less snacking between meals – something I’m prone to! ), lowered inflammation, and most importantly for me: support for my overworked adrenal glands. 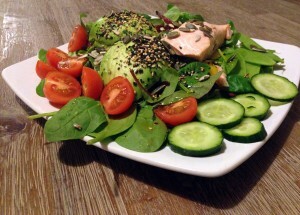 6.30am – mixed green salad, grated beetroot, avocado, peppers, tomatoes, steamed fillet of salmon, pumpkin seeds, furikake (sea vegetables with sesame seeds), 2 tablespoons flaxseed oil. Now that’s what I call breakfast…yum! 7pm – stir fry with olive oil, vegetables (e.g. pak choi, onion, peppers, cabbage, carrot, butternut squash etc) and meat, sprinkled with furikake, sunflower seeds, pumpkin seeds. I’ve been following this style of eating for a year now, having been almost vegan previously. For ethical reasons, as well as for nutrient value, I always look for organic and grass-fed meat, and wild fish wherever possible. I also aim to eat at least 10 types of organic vegetables per day although as you can see, I don’t do smoothies or juices – I just like to eat my food too much! If you are interested in eating a paleolithic diet too, you may like to take a look at Sarah Ballantyne’s website The Paleo Mom or book an appointment with me in London and we can discuss whether the diet would suit you. PS. Yes, I did cheat a little over Christmas. It was chocolate cake and it just looked too good…. Since February 2014 we have been accepting card payments with iZettle. This allows us to accept your payment from all main card providers including Visa, MasterCard, Maestro, American Express, Visa Electron, V Pay, and JCB. Alternatively, you can pay your balance by cash or by PayPal (in advance or at your appointment).